there’s a level of dissonance that comes from sitting in a new york city office desk, glancing over at a framed photograph of the poor, unlucky women I come from. in the usually creepy way of pictures, the gaze of my mother, two aunties, grandmother and cousin are fixed upon me. they’re watching me, from their distant vantage point. in this particular moment, which envelopes the past and the present all in one, we occupy worlds that could be no more different. 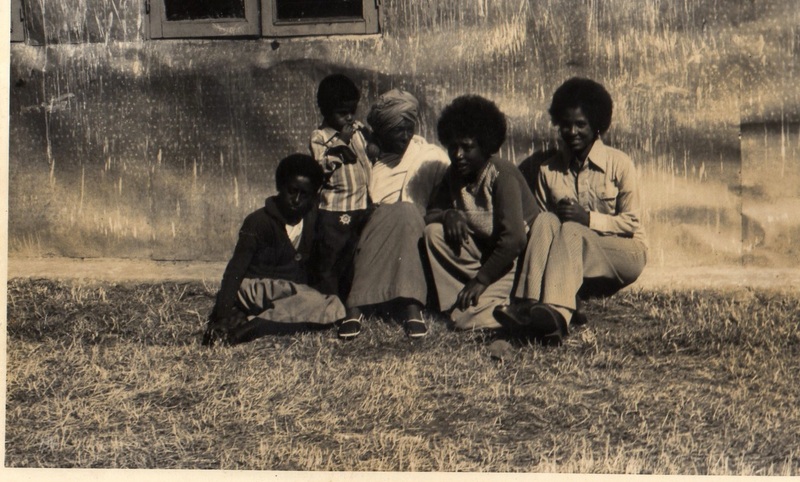 them, sitting in front their humble home in debre sina. or maybe it’s on the grounds of the local abiye high school. I wouldn’t know for sure, I haven’t set foot in my mother’s birthtown since I was five or so. meanwhile, I sit in a swivel chair staring out at a cold and rainy city gripped by blinding fog and myself overcome by monday morning blues. they look anchored, welcoming the camera into their world for this rare occasion of sitting for a photograph. it was probably my uncle behind that lens. and if not him then a camera person or service he arranged for his family, the exemplary one who made it out but still looked back to tend to the needs of his mother and sisters. he’s not in the frame and my grandfather had probably died by then. or maybe this was the period where he and my grandmother were no longer husband and wife, though he came back to her later toward the end of his life as he transitioned into his deathbed. she and her daughters nurtured the husband and father that left them long ago, without grudge or resentment. from where they’re sitting, close and huddled like that, they seem to be saying to me ‘we look to you, the girl who came from us and has gone farther than any one of us could ever imagine. we’re waiting for you to become. make us proud, although you’ve already surpassed all of our wildest visions for you. this is where we belong, we are destined to this land, this house, these circumstances. but you. you’ve already gone far, so far away from this small place. it’s almost as if you exist on a different plane. so, we’re waiting for your big news. for the names and legacies you will create for yourself, and thus for us. we were born and raised unlucky. God hasn’t blessed us with long age, wealth, or even a large many of us to keep one another company. we are a small people, in size and magnitude. Author betwixtandbetweenPosted on November 17, 2014 November 18, 2014 Tags aunties, diaspora, expectation, family, family photograph, grandmothers, monday morning blues, mothers, nostalgia, the women I come from, womanhood1 Comment on monday morning blues.